Infrared (IR) cameras have a long history in the industrial world, from security / surveillance to predictive maintenance applications in electrical and mechanical environments. IR camera manufacturers continue to push the limit of this unique technology through creative techniques to focus on various wavelengths within the electromagnetic spectrum. 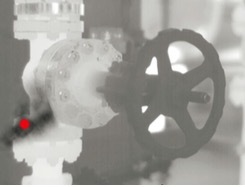 Due to physical properties, certain solids and gases can go from transparent to opaque when viewed through the lens of these specialized infrared cameras, allowing operators to now see the “unseen.” This paper and presentation will go through how infrared cameras used specifically for gas detection are engineered and how they positively affect the industries they are beginning to shape. Over the last few decades, thermal imaging through infrared camera technology has revolutionized maintenance programs for many industries, proving to be a superior method for finding hidden electrical and mechanical faults – even before they occur. Infrared cameras allow maintenance engineers to obtain a more complete picture of the operational health of a facility by identifying loose connections, refractory issues, load imbalances, and many other challenging-to-detect issues that commonly plague industrial environments. This, of course, offers clear, substantial benefits through cost savings, increased worker safety and enhanced product/process quality. As this impressive technology has evolved, infrared cameras can now also play a major role in detecting chemical compounds and gases that are invisible to the naked eye. This concept is commonly referred to as Optical Gas Imaging (OGI) and employs spectral filtering and various sensor optimizations to detect the absorptive and emissive properties of various gas compounds. 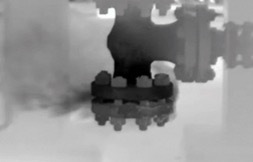 In the resulting image, escaping gases look like smoke against a contrasting background. Video can be viewed in real time and can be recorded in the camera for tracking, archiving, and reporting. Since many companies work intensively with these substances before, during and after their production processes, companies worldwide are adopting OGI technology to find large and small gas leaks so they can fix the problem and keep their employees safe. Additionally, strict regulations are beginning to govern how companies are to trace, document, rectify and report leaks of specific gas compounds that are deemed harmful to the environment (i.e., greenhouse gases). Earlier methods of gas detection required close or near contact using “sniffer” technology and probes. The limitations of these methods are that they are time consuming and run the risk of missing gas leaks. They may expose inspectors to invisible and potentially harmful chemicals, and are more susceptible to wind and other environmental factors that can produce inaccurate measurements. Inaddition,theycan only give readings within the immediate vicinity of the inspector. Alternatively, OGI cameras operate very much like a standard digital video camera. They have a lens, a viewfinder, and a small screen you can use to monitor from a safe distance. As it is an imaging technology, OGI can both visualize any gas in the area while leading you immediately to the source of the leak. 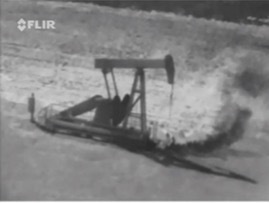 In fact, the Environmental Protection Agency (EPA) identifies Optical Gas Imaging as the “Best System of Emissions Reduction” for leak detection methodology used in various sectors within the Oil & Natural Gas supply chain. The trouble with many of the chemical compounds and gases used in the energy, manufacturing, and production industries is they are impossible to see with the naked eye. They can be dangerous to work with, dangerous to the environment, or both. Below, we quickly overview some of the core industries where OGI technology is transforming leak detection. Optical Gas Imaging can be crucial to improving leak detection and repair (LDAR) protocols along every step of the oil and gas value chain. Many energy producers rely on hydrogen- cooled generators to maintain safe operations in their power plants. It can be extremely difficult to detect hydrogen leaks and determine their source within the cooling systems. However, injecting a small amount of carbon dioxide (CO2) into the hydrogen makes it possible to visualize the leaks with OGI. ￼While sulfur hexafluoride (SF6) is an excellent insulator for circuit breakers and switchgear, it is also an extremely potent greenhouse gas – with an estimated global warming potential that’s 24,000 times higher than carbon dioxide. OGI helps electrical substation operators find SF6 leaks quickly and without the need to shut down equipment. These cameras can help pinpoint the source of leaks, so crews can make repairs before there is any danger of breaker failures. Carbon monoxide emissions can be a serious threat to primary steel manufacturing operations and other industries that produce CO as part of their manufacturing processes. 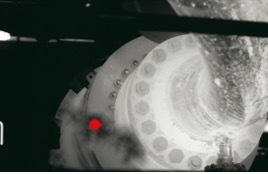 An OGI camera can allow plant managers to quickly identify the source of CO leaks, so the gas doesn’t collect in enclosed areas, causing a safety hazard. These cameras are also ideal for monitoring for CO leaks in plants where leaky components are difficult to reach with contact measurement tools. Anhydrous ammonia, or pure NH3, is a low- cost, energy efficient refrigerant with industrial applications. While NH3 is not considered a greenhouse gas, it is explosive when mixed with air and a potent irritant. Food and pharmaceutical operations need to keep working, even when there is a possible refrigerant gas leak. 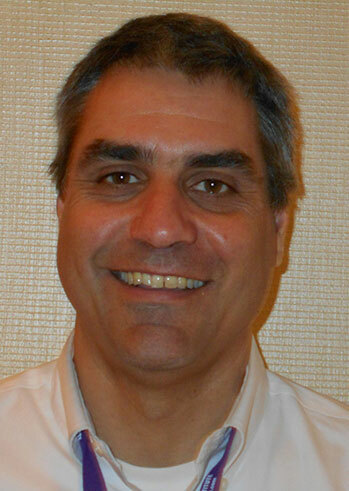 Shutting down operations to find a leak could result in huge product and profit losses. But finding refrigerant gas leaks is important, because many are highly toxic and harmful to the environment. With OGI, plant managers can search for leaks quickly – without disrupting production – and then schedule the needed repairs. Not every OGI application lends itself to operator surveys using handheld cameras. For that reason, some companies offer fixed camera solutions with specialized automation software programmed to alarm when gases are detected. 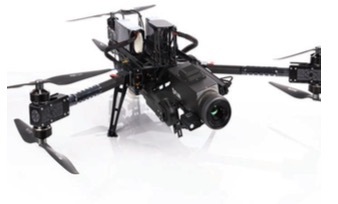 Other companies are combining OGI technology with advances in unmanned aerial vehicles (drones) to search for gas leaks in inaccessible or dangerous areas. As discussed, an optical gas imaging camera can be considered a highly specialized version of an infrared or thermal imaging camera. There is a lens, a detector, some electronics to process the signal from the detector, and a viewfinder or screen for the user to see the image produced by the camera. The detectors used for OGI cameras are quantum detectors that require cooling to cryogenic temperatures (around 70K or – 203°C). Midwave cameras that detect gases such as methane commonly operate in the 3-5 μm range and use an indium antimonide (InSb) detector. Longwave cameras that detect gases such as sulfur hexafluoride tend to operate in the 8-12 μm range and use a quantum well infrared photodetector (QWIP). When the materials used for quantum detectors are at room temperature, they have electrons at different energy levels. Some electrons have sufficient thermal energy to be in the conduction band, meaning the electrons there are free to move and the material can conduct an electrical current. Most of the electrons; however, are found in the valence band, where they do not carry any current because they cannot move freely. When the material is cooled to a low enough temperature, which varies with the chosen material, the thermal energy of the electrons may be so low that none can reach the conduction band; therefore, the material cannot carry any current. When these materials are exposed to incident photons, and the photons have sufficient energy, the energy stimulates electrons in the valence band, causing them to move up into the conduction band. Now the material (the detector) can carry a photocurrent, which is proportional to the intensity of the incident radiation. There is a very exact energy threshold of incident photons that will allow an electron to jump from the valence band into the conduction band. This energy is related to a certain wavelength: the cut-off wavelength. Since photon energy is inversely proportional to its wavelength, the energies are higher in the shortwave/midwave band than in the longwave band. Therefore, as a rule, the operating temperatures for longwave detectors are lower than for shortwave/midwave detectors. For an InSb midwave detector, the necessary temperature must be less than 173 K (-100°C), although it may be operated at a much lower temperature. Whereas, a QWIP longwave detector typically needs to operate at about 70 K (-203°C) or lower. The incident photon wavelength and energy must be sufficient to overcome the band gap energy, ΔE. 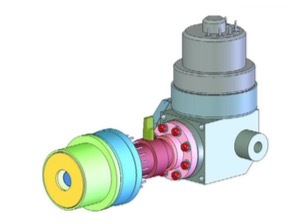 The detectors in most OGI cameras are cooled using Stirling Coolers. The Stirling process removes heat from the cold finger (Figure 1) and dissipates it at the warm side. The efficiency of this type of cooler is relatively low, but good enough for cooling an IR camera detector. Another complexity is the fact that each individual detector in the focal plane array (FPA) has a slightly different gain and zero offset. 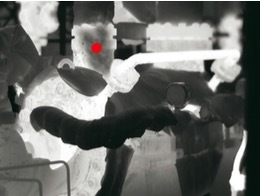 To create a useful thermographic image, the different gains and offsets must be corrected to a normalized value. This multi-step calibration process is performed by the camera software. The final step in the process is the Non-Uniformity Correction (NUC). In measurement cameras, this calibration is performed automatically by the camera. In the OGI camera, the calibration is a manual process. This is because the camera does not have an internal shutter to present a uniform temperature source to the detector. The ultimate result is a thermographic image that accurately portrays relative temperatures across the target object or scene. 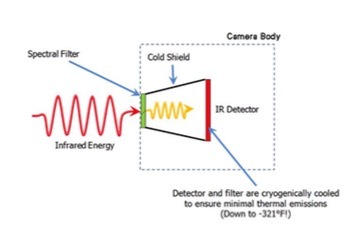 No compensation is made for emissivity or the radiation from other objects that is reflected from the target object back into the camera (reflected apparent temperature). The image is a true image of radiation intensity regardless of the source of the thermal radiation. The OGI camera uses a unique spectral filter method that enables it to detect a gas compound. The filter is mounted in front of the detector and cooled along with it to prevent any radiation exchange between the filter and the detector. The filter restricts the wavelengths of radiation allowed to pass through to the detector to a very narrow band called the band pass. This technique is called spectral adaptation. For the majority of gas compounds, infrared absorption characteristics are wavelength dependent. 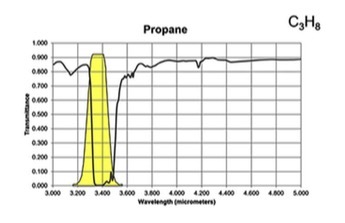 In Figures 3A and 3B, the absorption peak for propane and methane are demonstrated by the severe drop in transmittance lines on the graphs. The yellow regions represent a sample spectral filter used in an OGI camera, which is designed to correspond to the wavelength range where most background infrared energy would be absorbed by the particular gas of interest. Most hydrocarbons absorb energy near 3.3 μm, so the sample filter in Figures 3 can be used to detect a wide variety of gases. Response factors (RF) for more than 400 additional compounds are available at the following site: http://rfcalc. providencephotonics.com. 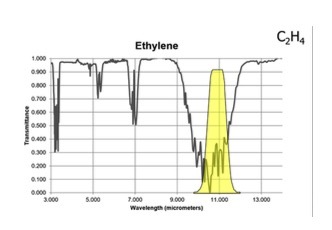 Ethylene has two strong absorption bands, but a longwave sensor will detect this gas with greater sensitivity than a midwave sensor based on the transmittance curve shown below. 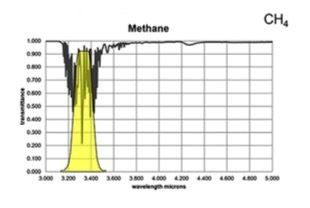 Selecting a filter that restricts the camera to operating only in a wavelength where a gas has a very high absorption spike (or transmission trough) will enhance the visibility of the gas. The gas will effectively ‘block’ more of the radiation coming from the objects behind the plume in the background. If the camera is directed at a scene without a gas leak, objects in the field of view will emit and reflect infrared radiation through the lens and filter of the camera. The filter will allow only certain wavelengths of radiation through to the detector and from this the camera will generate an uncompensated image of radiation intensity. If a gas cloud exists between the objects and the camera and that gas absorbs radiation in the band pass range of the filter, the amount of radiation passing through the cloud to the detector will be reduced (Figure 5). In order to see the cloud in relation to the background, there must be a radiant contrast between the cloud and the background. That is to say, the amount of radiation leaving the cloud must not be the same as the amount of radiation entering it (Figure 6). If the blue arrow in Figure 6 is the same size as the red arrow, the cloud will be invisible. In reality, the amount of radiation reflected from the molecules in the cloud is very small and can be ignored. So, the key to making the cloud visible is a difference in apparent temperature between the cloud and the background (Figure 7). Note: many OGI cameras are now calibrated to measure temperature as well. This offers critical value to the operator when assessing for adequate thermal background or Delta T, which is defined as the apparent temperature difference between gas and background scene. As history demonstrates and as infrared camera technology continues to evolve, the applications are endless and will be up to the imagination of the operator. Optical Gas Imaging may be complex to engineer, but it is very simple to operate. New innovations are shaping the technology as intrinsically safe designs, leak quantification, and autonomous plume detection seem to be the next frontier for this unique concept.